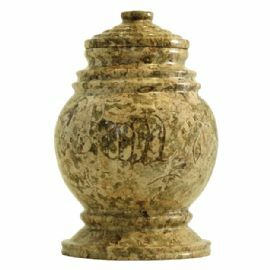 The Princess Fossil genuine stone keepsake cremation urn is crafted from natural-quarried marble in the shape of a classic style vase. Our loved ones are truly royalty within our own life’s story. The majestic nature of this urn will give tribute to that special someone who was the crowning jewel in one’s life. It has a top-opening lid that can be sealed closed using the included epoxy sealant.